Ready to swap starchy spaghetti for something a bit lighter and still as flavorful? 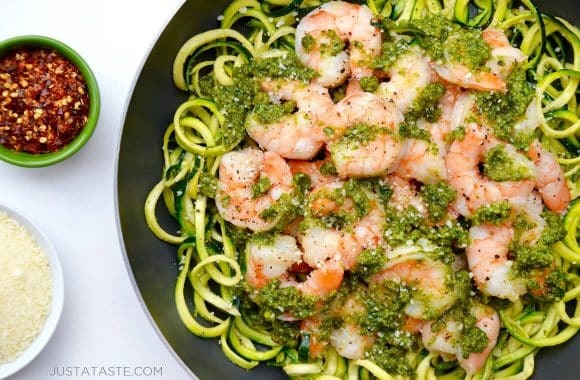 Then look no further than this quick and easy recipe for Pesto Zucchini Noodles with Shrimp! Everyone’s favorite veggie-turned-noodle kicks the carbs to the curb and becomes the perfect canvas for homemade pesto starring loads of fresh basil and garlic. 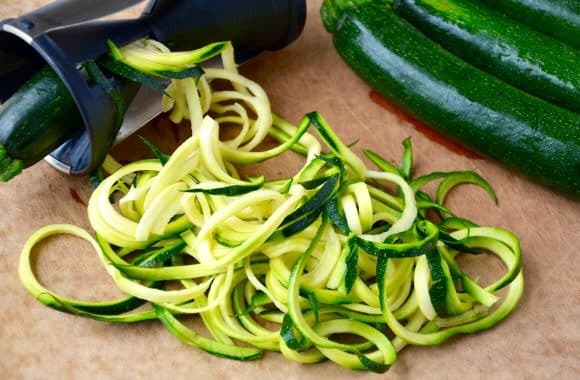 And for all those zucchini noodle lovers that find themselves spiralizer-less, have no fear because I’ve got you covered! Check out my video tutorial for three ways to make zucchini noodles without a spiralizer. And it’s as easy as that! Pesto zucchini noodles can now be enjoyed by all, regardless of the culinary equipment (or lack thereof) in their kitchen. So grab your gear of choice and get ready for a low-carb take on a classic Italian pasta favorite. 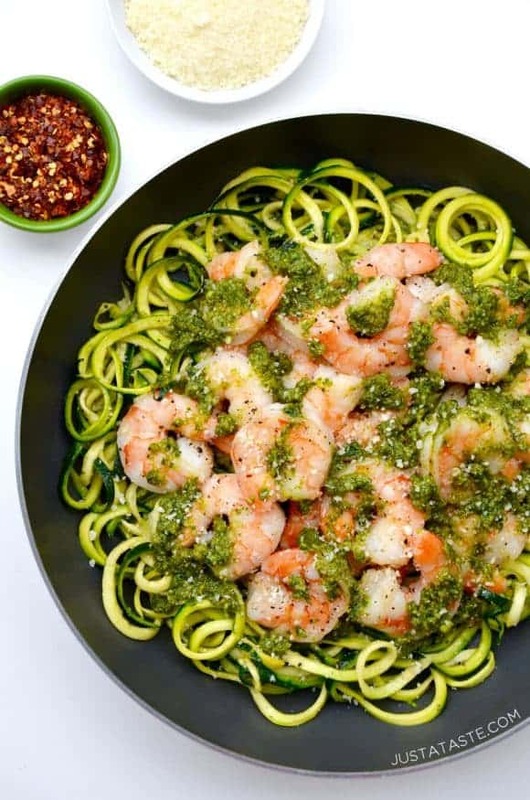 Find inspiration for more quick and easy zoodle recipes, including Skinny Shrimp Scampi with Zucchini Noodles, Asian Zucchini Noodle Stir-Fry, Zucchini Noodle Chicken Soup and more crowd-friendly favorites. 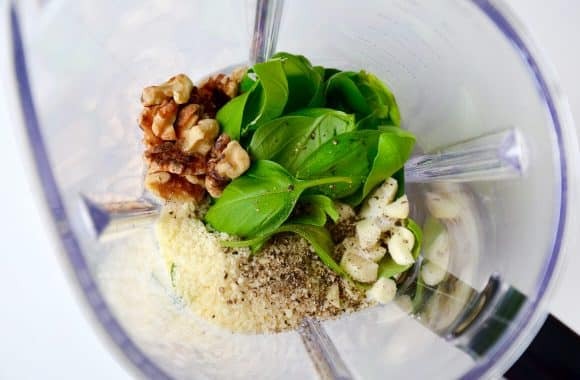 In a blender, combine the basil, walnuts, Parmesan cheese, garlic, 1/2 teaspoon salt and 1/4 teaspoon pepper. Pulse until roughly chopped then with the blender running, stream in 1/2 cup olive oil and continue blending, scraping down the sides as needed, until the pesto is puréed. Set the pesto aside. Add 1/2 tablespoon olive oil to a large sauté pan set over medium heat. Add the shrimp and a pinch of salt and pepper, and cook, stirring, until the shrimp are pink and cooked through. 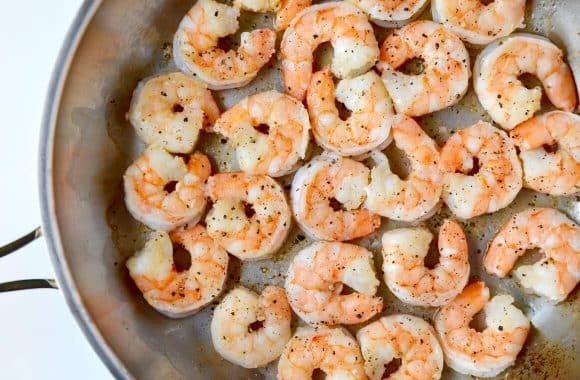 Using a slotted spoon, transfer the shrimp to a bowl. Add the remaining 1/2 tablespoon olive oil to the sauté pan set over medium heat. Add the zucchini noodles and cook them, tossing frequently, until they’re softened slightly. Reduce the heat to low then add the shrimp and pesto to the pan and toss to combine. Serve immediately.